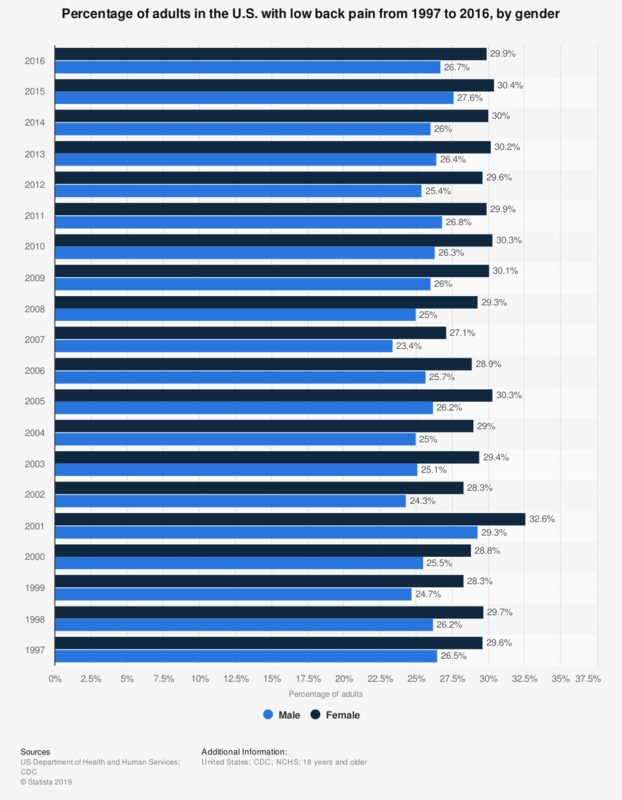 This statistic shows the percentage of adults in the U.S. with low back pain from 1997 to 2016, by gender. In 2016, 26.7 percent of all male adults in the U.S. had such problems during the previous three months. In three separate questions, respondents were asked, "During the past 3 months, did you have a severe headache or migraine? ...low back pain? ...neck pain?" Respondents were instructed to report pain that had lasted a whole day or more, and not to report fleeting or minor aches or pains. Persons may be represented in more than one column. Estimates are age-adjusted to the year 2000 standard population using five age groups: 18-44 years, 45-54 years, 55-64 years, 65-74 years, and 75 years and over. Age-adjusted estimates in this table may differ from other age-adjusted estimates based on the same data and presented elsewhere if different age groups are used in the adjustment procedure. Includes all other races not shown separately, unknown education level, and unknown disability status.